Welcome to my stop on the Crafty Friends hop! The first one was at the Altenew Scrapbook Blog – and you’re here at stop #2….so you should be on the right track! Supplies and giveaways are toward the end of the post, so keep on a-scrolling, but for now let’s get to some pretty cards, okay? 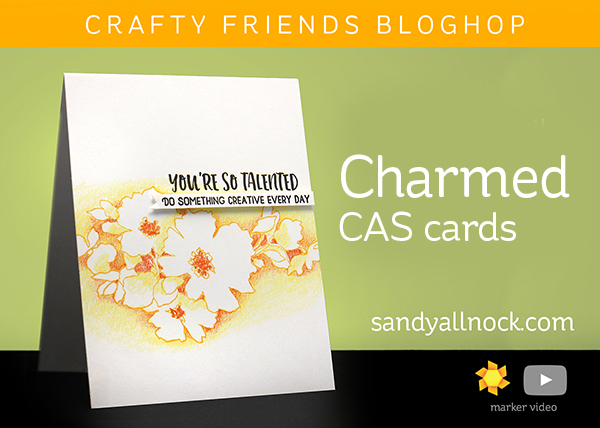 I decided on some CAS cards that combine the new Crafty Friends set with Charmed – because who doesn’t love flowers, right? The sentiments go with *anything* as you’ll see in the video – you can use cute stamps, elegant stamps, funny stamps – or just make a background and let the stamp be the hero! And if you want to hear the story of how I got started crafting, you’ll have to watch the video below or click HERE to see it in HD on YouTube! I made a set of these with slightly different layouts, just turning the flower stamp different directions and stamping the sentiments in different places. 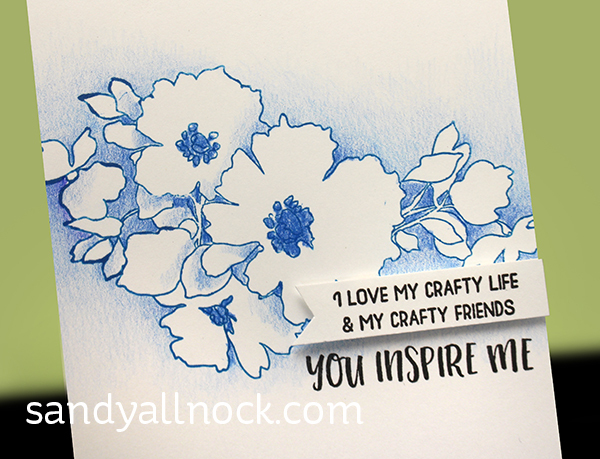 …and of course dimensional adhesive for a secondary sentiment adds a little something special to the card! I’m part of a hop, so of course you can start one-stop-back at the beginning – at the Altenew Scrapbook Blog. Be sure to leave comments by Friday, October 27th, 2017 at 11:59 PM EDT for a chance to win! 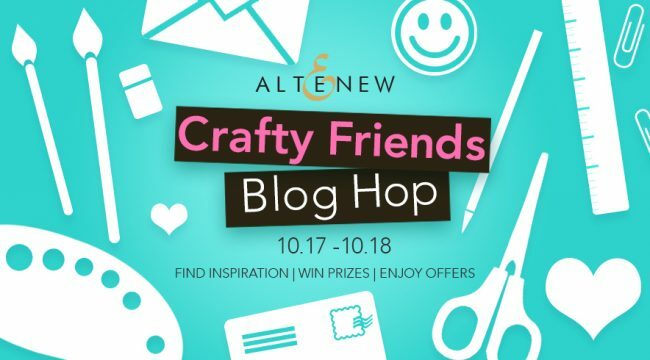 20 WINNERS will be chosen at random from the comments left on all of these blogs listed below and will be announced on the Altenew Card Blog and Altenew Scrapbook Blog on October 28th, 2017. …is Therese Calvird! Hurry, hurry, go see! Great idea with just one color! I love it! Love how you switched up the CAS card! I use CAS style for lots of crafting. Your cards are just GORGEOUS! I have gotten your daily /weekly e-mails FOREVER now and enjoy them sooooo much. You are such an inspiration to me. I know my crafting wouldnt be what it is today without you! Thank you! FABULOUS cards. Love them all! Beautiful cards! 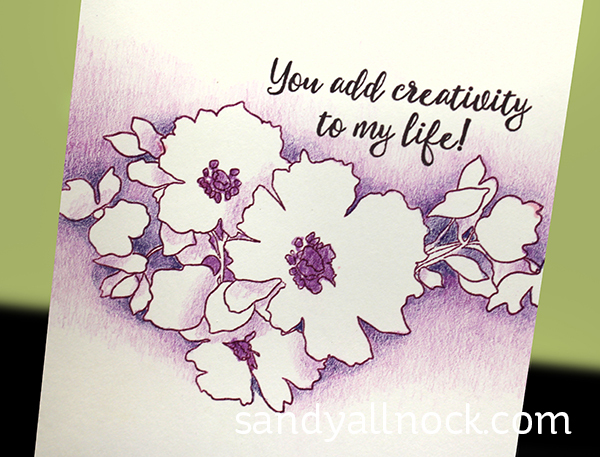 I love the soft colours and the blending in the negative space around the flowers. I also really like how you switched it up by changing the image position. Thanks for sharing your crafty friends story with us! How pretty! Love the colors and effect!